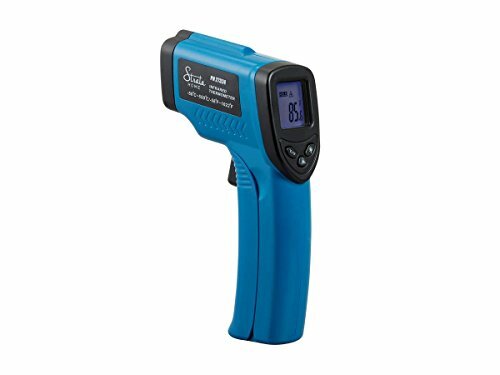 Measuring the temperature of any object or surface is simple and easy using this digital infrared thermometer. Simply aim the thermometer at the surface or object you want to measure and press the button. It will then display the result on the LCD screen. It measures temperatures from -58.0 ~ +1022.0°F (-50.0 ~ +550.0°C) with ±2% or ±2°C accuracy and 0.1° resolution. It is perfect for cooking, home repairs, and auto maintenance. Versatile: Featuring a wide measurable temperature range, this thermometer is great for cooking, home repairs, and auto maintenance. Accurate: The thermometer is accurate ±2% or ±2°C, ensuring accurate readings with every use. Celsius and Fahrenheit: The thermometer features a wide measurement range from -58.0 ~ +1022.0°F (-50.0 ~ +550.0°C) with 0.1° resolution. Converting from Celsius to Fahrenheit readings is as simple as pressing the °C/°F button. Clear Display: The clear display makes viewing temperature readings simple and easy. A backlight button allows you to read the display in even total dark conditions. Versatile:Featuring a wide measurable temperature range, this thermometer is great for cooking, home repairs, and auto maintenance. Accurate:The thermometer is accurate 2% or 2C, ensuring accurate readings with every use. Celsius and Fahrenheit:The thermometer features a wide measurement range from -58.0 ~ +1022.0F (-50.0 ~ +550.0C) with 0.1 resolution. Converting from Celsius to Fahrenheit readings is as simple as pressing the C/F button. Clear Display:The clear display makes viewing temperature readings simple and easy. A backlight button allows you to read the display in even total dark conditions. Scan and Lock: Temperature readings will hold for 15 seconds, so you have plenty of time to note the reading.